Arch Domes – Not Just at Notre Dame! 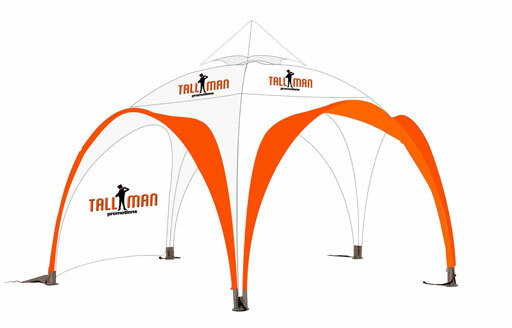 TALLMAN.PROMO solid frame arch tents are unique in design, while similar to our instant canopies. The arch tent takes a little longer to set up, but is a little more eye-catching. The print is high quality and the colours match, while the fabric is flame retardant and UV protected. The tent offers a unique and distinguished style different from other canopies, but offers equal durability and they have a fantastic life expectancy. Let’s work together and design a sharp logo, slogan or other important message to attract your audience. You can attach tent walls to the poles for a backdrop or on windy days. The arch dome is water resistant, flame retardant and has UV protection. We are always here to help so contact us for more details. The Arch Dome has additional product options to customize your tent. You can add tent walls, or valances that attach to the poles for numerous reasons like, staying out of the wind, adding a backdrop or just a little extra branding. The Material of the arch tent is 500D Polyester Oxford. Dome tents come with the option to add up to 4 valances and four full walls.